The Bulle MOLLE M4 Quad Pouch is large enough to accommodate 4x M4, M16 or SA80 magazines side by side, or 2x G36 magazines side by side (3 G36 magazines with some creative pushing). The pouch measures approximately 190mm tall, 120mm wide and 70mm deep. 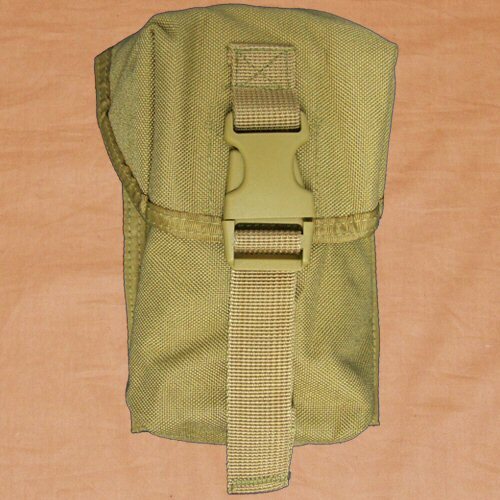 Due to the size and generic nature of the pouch, it can also be used as a large FFD pouch, UK forces size small utility pouch and for storing other sundries. The pouch is fully lined with 1000D Cordura nylon material for stability and durability, and to prevent snagging of contents against the walls of the pouch. The pouch lid is a fully enclosed type providing coverage over top, front and sides which help to prevent damp, dirt and dust from entering and is the preferred system for issue pouches. The lid closes with an adjustable military specification Duraflex UTX Stealth quick release buckle and silenceable velcro on the front. The inside of the lid is fitted with extra velcro to allow the lid to be retained in an open position when quick access to the contents is required. 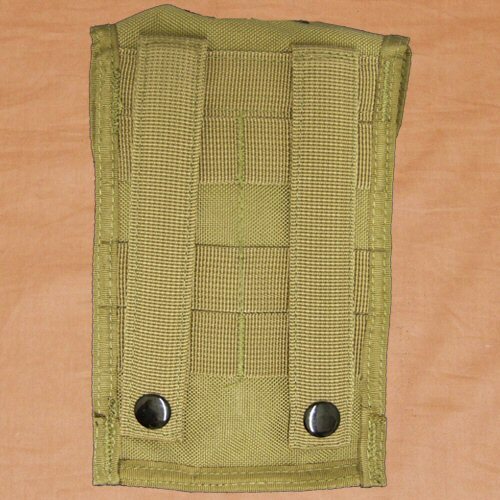 The rear of the pouch is fitted with two vertical straps for fitting onto the MOLLE base and three additional horizontal MOLLE straps for interweaving which gives better stability during movement. These are finished with a press stud each. 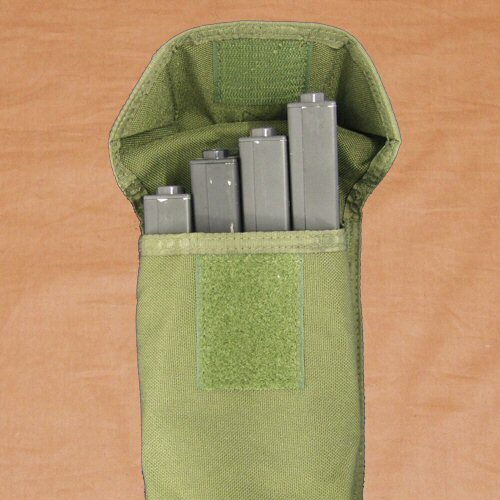 The pouch is medium profle, with a low space requirement on the MOLLE base. The M4 Quad pouch is constructed from 1000D Cordura nylon fabric and Cordura 25mm webbing. All plastic toggles and buckles are military specification Duraflex UTX Stealth parts which offer better performance, durability and heat resistance over unbranded buckles. Please note that price is for ONE pouch only. Accessories shown are for illustration purposes only. View of rear of the pouch showing the MOLLE webbing.